Why are Potatoes Ridged up with Earth? Earthing up potatoes stops the light getting to the growing tubers. If potatoes catch light, they turn green and they should not be eaten. 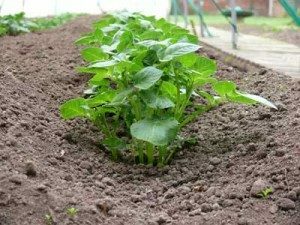 Earthing up potatoes into a ridge improves the yield of potatoes. It is better to have soil on the shoulder, rather than taking the ridge to a sharp point, because the potatoes grow in the shoulder of the ridge. If the row is 30 inches wide, the ridge is usually about 6 inches above soil level. Any higher and the soil runs down as there is a natural angle of repose. The top of the ridge needs to be 4 or 5 inches wide. 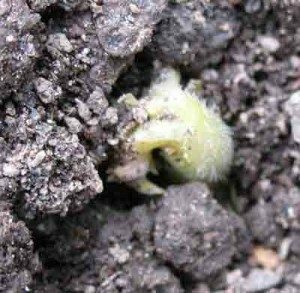 As the stems grow, they are covered with earth two or three times, so a ridge develops. Soil from between the row is used, traditionally. This is why the potato rows are quite wide, so that there is plenty of soil available. A row 30 inches wide allows plenty of soil for ridging up. Black plastic may be used.